Matured in the traditional style in American bourbon barrels, this whisky is then ‘finished’ in Madeira barrels, sourced from the semi-tropical Portuguese island of Madeira, hundreds of miles off the coast of north-west Africa, in the Atlantic Ocean. During this second period of maturation, the whisky derives many interesting characteristics specific to the Madeira barrel. 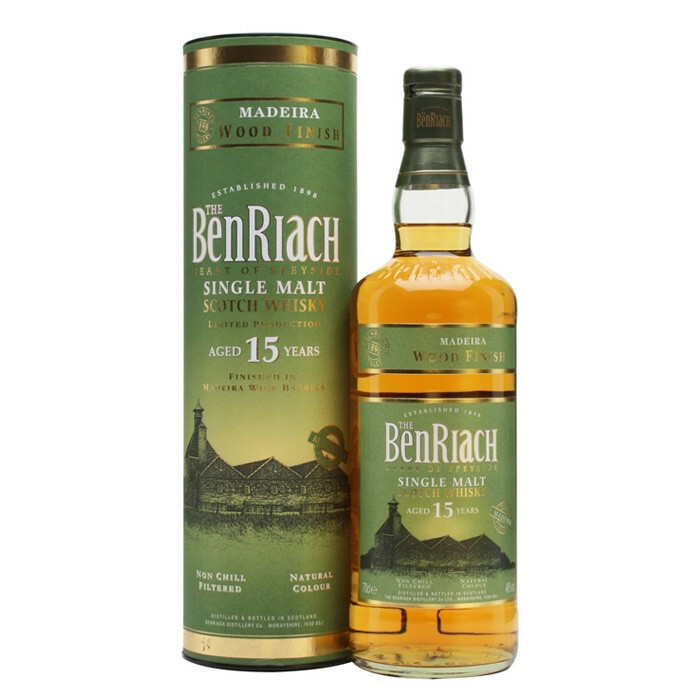 With only a limited quantity made available world-wide, the Madeira Finish is part of the first BenRiach ‘Wood Finish Series’, released November 2006. Nose: Sweet, spicy, citrussy. Oak, fresh fruit. Palate: Esters, eucalyptol freshness, toffee, sherry. Thick mouthfeel. Finish: Long, clean, pine and hazelnut.